Ideal Bridal and Dry Cleaning has been providing professional alterations and tailoring for formal gowns, wedding dresses, suits, tuxedos, and men’s and women's formalwear for over 25 years. In that time, we have provided countless individuals with customized looks that perfectly fit their body type and style. Ideal Bridal is known for not only for their eye for style, but for the ability to transform existing gowns and tuxedos into custom items that are as stunning as they are perfectly tailored. What Types of Items Can You Customize and Tailor? We provide tailoring and alterations for all types of gowns, dresses, suits and tuxedos, including wedding dresses, bridesmaid’s dresses, prom dresses, homecoming, mother of the bride dresses, flower girl dresses, and more. Additionally, we can tailor, customize, and alter almost any type of clothing! 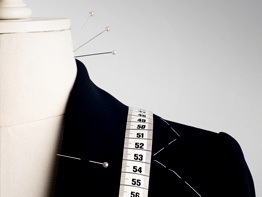 Are you in a tight spot and need last minute alterations for a special event? At Ideal Bridal and Dry Cleaning, we will always do our best to accommodate those in need of emergency tailoring, alterations, or customizations. Additionally, we provide professional dry cleaning services for removing tough stains on even the most sensitive garments. If you choose us for to dress your bridal party, you can get peace of mind knowing we’ll go the extra mile in to ensure that you get the services you need, when you need them. To schedule a measurement and fitting, or to discuss your tailoring and alteration needs, contact Ideal Bridal and Dry Cleaning today. We are excited to make sure you get the perfect style and fit! Our store is conveniently located in Livonia, near Novi, Northville, Westland, Farmington, Farmington Hills, and the surrounding Southeast Michigan areas.